For the past few years, guests wishing to travel to Walt Disney World's two water parks - Blizzard Beach and Typhoon Lagoon - had to first take a bus to Disney Springs and then change to a different service for their chosen water park. However beginning on Sunday 17th March 2019, the Disney resort hotels will once again start offering their own direct bus routes for each water park. 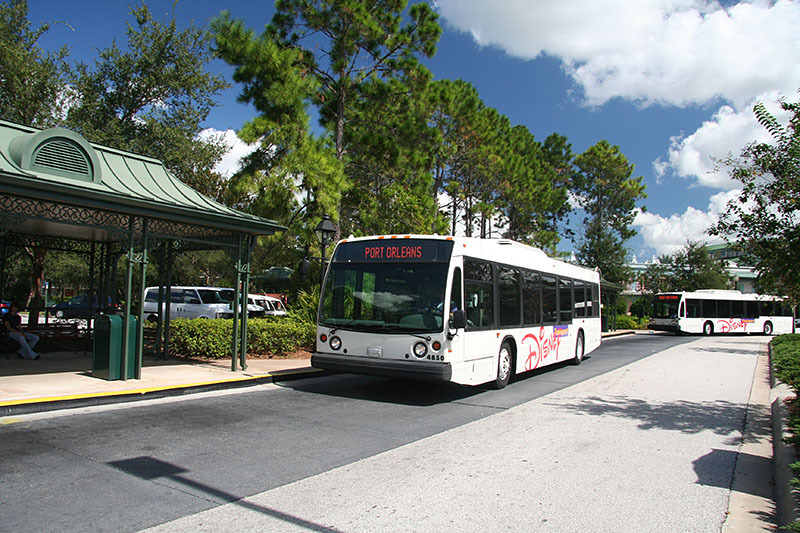 Some resort hotels will provide a combined bus service - for example all three All Star resorts will share buses - but the wording on Disney's release seems a little unclear when it comes to the Port Orleans Resorts. Riverside and French Quarter are not listed within the shared services list, but Port Orleans is mentioned in the section covering larger resorts which will only offer one pickup point. Only the South Depot is mentioned in that list though, which makes sense for the Riverside portion of the service, but it won't be appreciated by French Quarter guests. 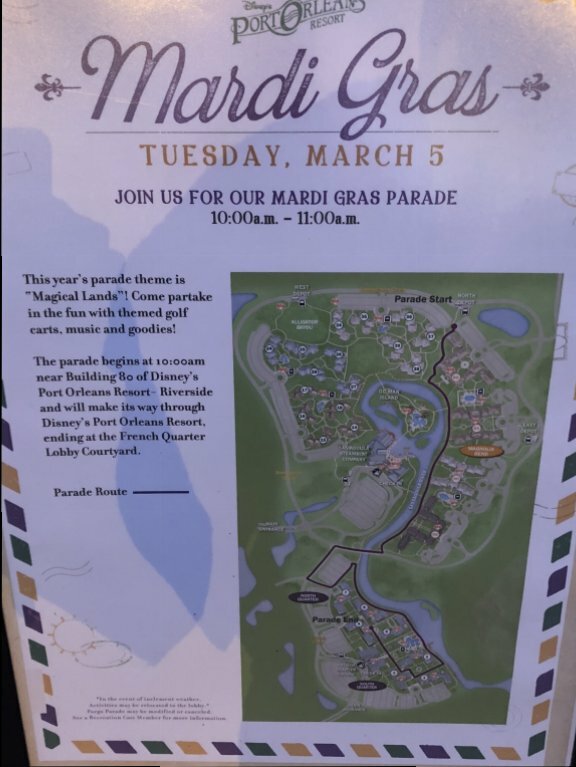 This situation will presumably be clarified soon, but my best guess would be that there will be shared services calling at the Port Orleans Riverside South Depot and also at the single Port Orleans French Quarter stop, but not at the other three 'outer circle' stops at Riverside. I'll provide further information once anything is confirmed. Guests wishing to travel from a theme park to a water park will still need to change though, by first boarding a bus to the most convenient resort and then changing to a direct water park service from there. 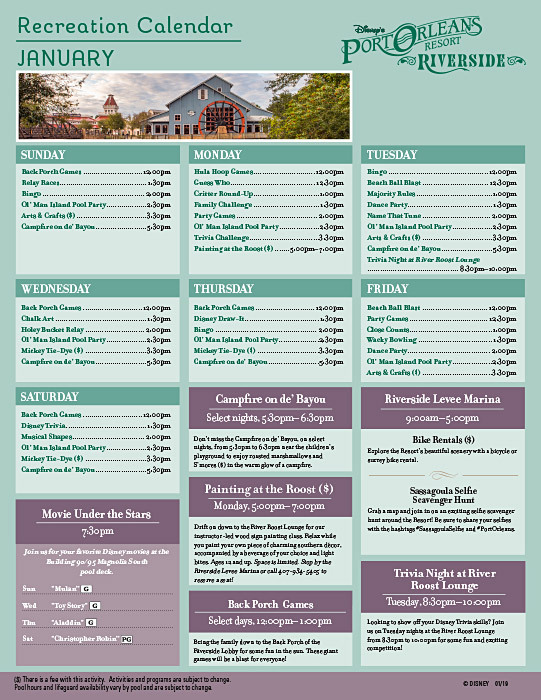 The March 2019 Recreation Activities and Movie Schedules for Port Orleans Riverside and Port Orleans French Quarter are now available. 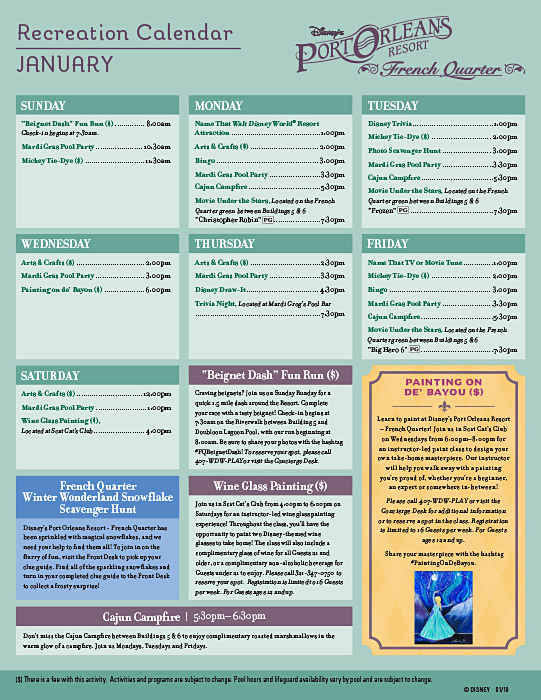 See the main Recreation Activities Schedules page for full-size printable PDF versions. The main feature swimming pool operating hours are currently 10am—8pm, outside of which the pools and hot tubs are gated and locked as there are no lifeguards on duty. This will be changing to 9am—11pm from 10 March 2019. The five Riverside leisure (quiet) pools are officially listed as 9am—10pm but they are not locked and are generally available at any time within reason. Movies Under the Stars will be screened at 8:30pm six nights a week at Riverside (except Tuesdays), and on Mondays, Tuesdays and Fridays at French Quarter. Note: the Riverside movie screenings are now shown on the pool deck area near to building 95 (between Parterre Place and Oak Manor). Evening Campfire Activities will take place from 6:30pm-7:30pm on the same nights as the movies at French Quarter, and every night at Riverside. You can roast marshmallows for free, or you can optionally purchase full s’mores kits, all in the warm glow of a night-time campfire. Mardi Gras is on Tuesday 5th of March this year and the theme for the annual cast member Pargo Parade will be “Magical Lands of Disney”. The parade begins at 10am near to Riverside building 80 (Acadian House) and will finish at around 11am at the French Quarter Lobby Courtyard near building 6. 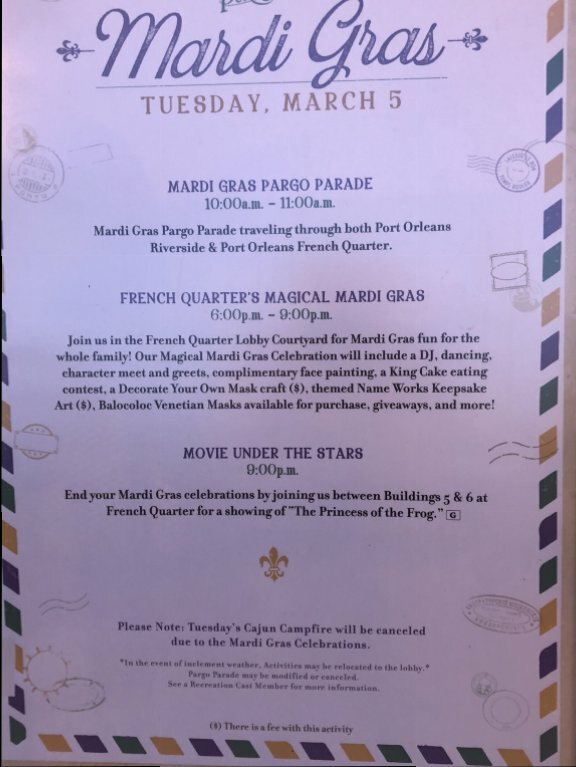 There will also be a “Magical Mardi Gras” courtyard party at French Quarter for the whole family from 6pm—9pm. The celebrations will include a DJ, dancing, character meet and greets, complimentary face painting, a King Cake eating contest, a Decorate Your Own Mask craft event ($), themed Name Works Keepsake Art ($), Balocoloc Venetian Masks available for purchase, giveaways, and more! There will be no Cajan Campfire in the evening due to the other celebrations taking place, but the Movie Under the Stars at 9pm will of course be Disney’s New Orleans themed The Princess and the Frog. All events are weather permitting, and the evening celebration will be moved indoors to the lobby area if necessary. 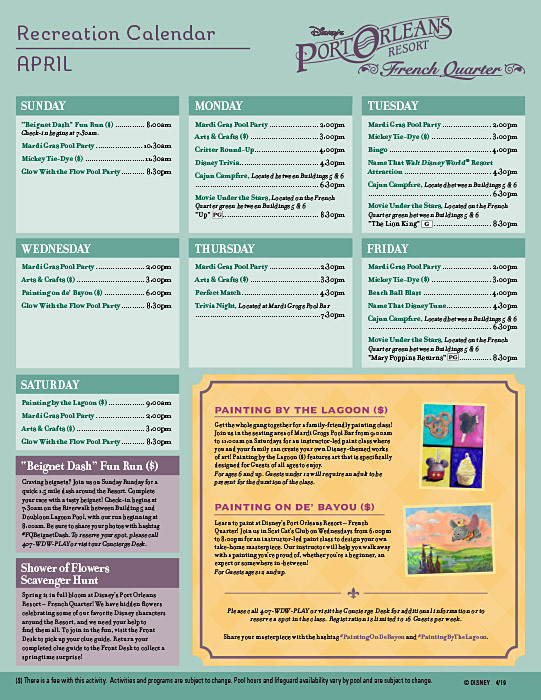 Painting by the Lagoon ($) (French Quarter, 9am—11am Saturdays) — Get the whole gang together for a family-friendly painting class! 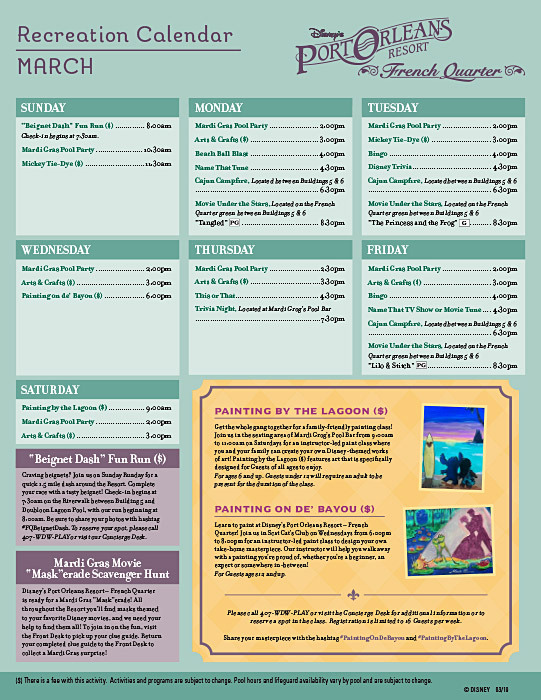 Join us in the seating area of Mardi Grogs Pool Bar for an instructor-led paint class where you and your family can create your own Disney-themed works of art! For ages 6 and up (under 12s will require an adult to be present for the duration of the class). 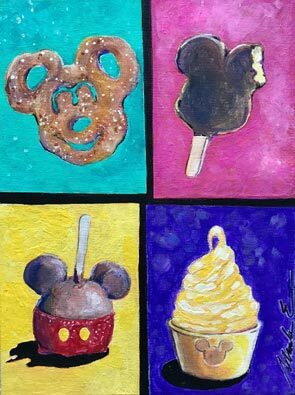 This will feature art that is specifically designed for guests of all ages to enjoy. Registration is limited to 16 guests, please call 407-WDW-PLAY or visit the Concierge desk for additional information or to reserve a spot in the class. Share your masterpiece with the hashtag #PaintingByTheLagoon. 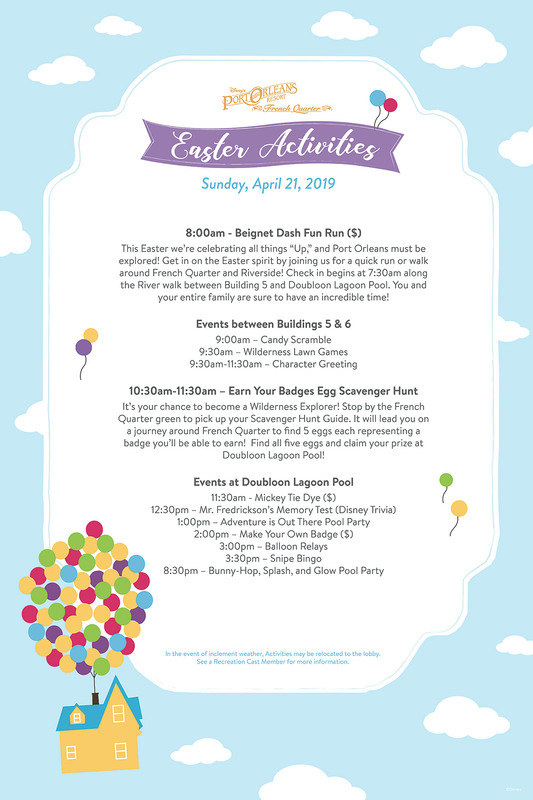 Back Porch Games (Riverside, 1pm Sundays & Fridays ; the 12pm time on the schedules is a misprint) — Bring the family down to the Back Porch of the Riverside Lobby for some fun in the sun. These giant games will be a blast for everyone! Mardi Gras Movie “Mask”-erade Scavenger Hunt (French Quarter, daily) — All throughout the Resort you’ll find masks themed to your favorite Disney movies, and we need your help to find them all! To join in on the fun, visit the Front Desk to pick up your clue guide. Return your completed clue guide to the Front Desk to collect a Mardi Gras surprise! 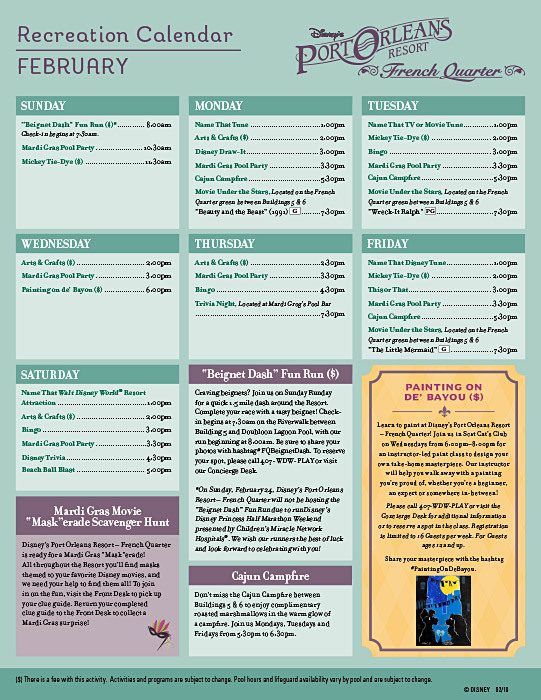 The February 2019 Recreation Activities and Movie Schedules for Port Orleans Riverside and Port Orleans French Quarter are now available. 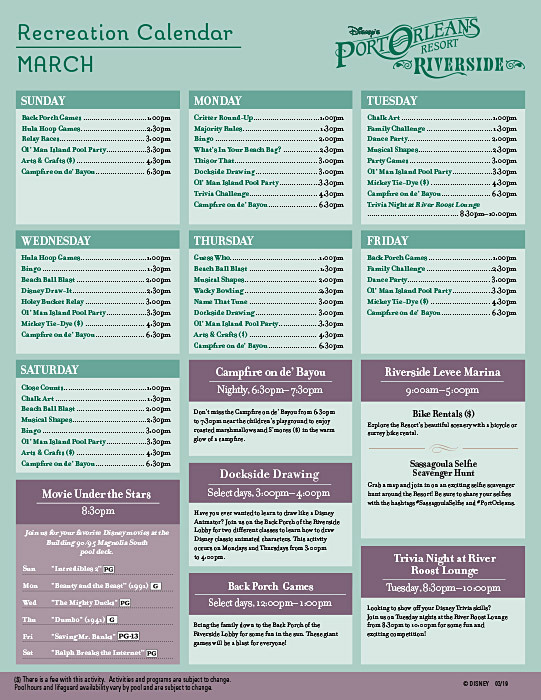 See the main Recreation Activities Schedules page for full-size printable PDF versions. The main feature swimming pool operating hours are currently 10am—8pm, outside of which the pools and hot tubs are gated and locked as there are no lifeguards on duty. The five Riverside leisure (quiet) pools are officially listed as 9am—10pm but they are not locked and are generally available at any time within reason. Movies Under the Stars will be screened at 7:30pm on Sundays, Wednesdays, Thursdays and Saturdays at Riverside, or Mondays, Tuesdays and Fridays at French Quarter. Note: the Riverside movie screenings are now shown on the pool deck area near to building 95 (between Parterre Place and Oak Manor). “Beignet Dash” Fun Run ($) (French Quarter, 8am Sundays) — Craving beignets? Join us on Sunday Runday for a quick 1½ mile dash around the Resort. Complete your race with a tasty beignet! Check-in begins at 7:30am on the Riverwalk between Building 5 and Doubloon Lagoon Pool and the run begins at 8am. Be sure to share your photos with the hashtag #FQBeignetDash. Cost is $15+tax, including three beignets and a souvenir “medal”. To reserve your spot, please call 407-WDW-PLAY or visit the Concierge Desk. Note: There will be no Beignet Dash on Sunday 24 February due to runDisney’s Disney Princess Half Marathon Weekend. We wish our runners the best of luck and look forward to celebrating with you! 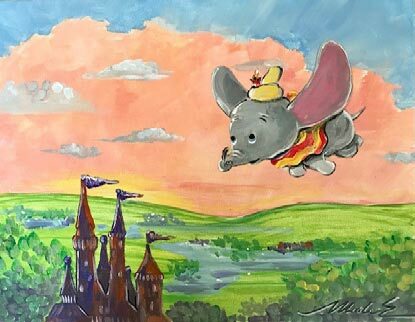 Dockside Drawing (Riverside, 3pm—4pm Mondays & Thursdays) — Have you ever wanted to learn to draw like a Disney Animator? 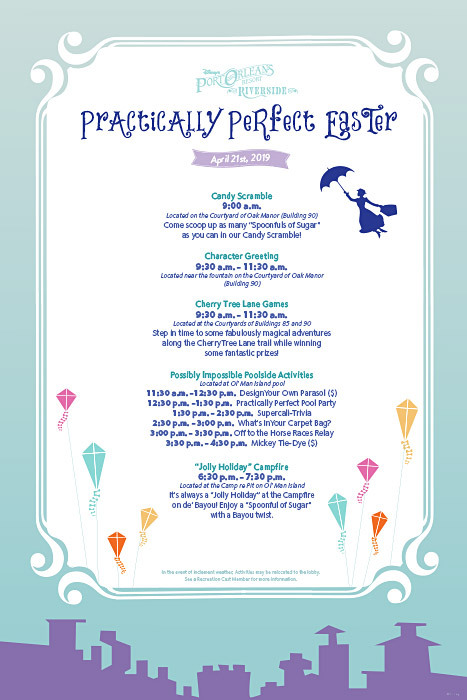 Join us on the Back Porch of the Riverside Lobby to learn how to draw Disney classic animated characters. Note: This replaces the Wine Glass Painting and Painting at the Roost activities which have been offered over the last couple of months. Back Porch Games (Riverside, 12pm—1pm Sundays, Wednesdays, Thursdays & Saturdays) — Bring the family down to the Back Porch of the Riverside Lobby for some fun in the sun. These giant games will be a blast for everyone! There will also be themed poolside activities on Valentine’s Day, but otherwise the next major event will be Mardi Gras on 5th March. No visit to Port Orleans Riverside would be complete without spending an evening in the company of the legendary “Ye Haa” Bob Jackson at the River Roost Lounge, playing 8:30pm—midnight four nights a week (Wednesday, Thursday, Friday and Saturday). Note: Bob will not be performing at the Port on Friday 22 February due to a private commitment. 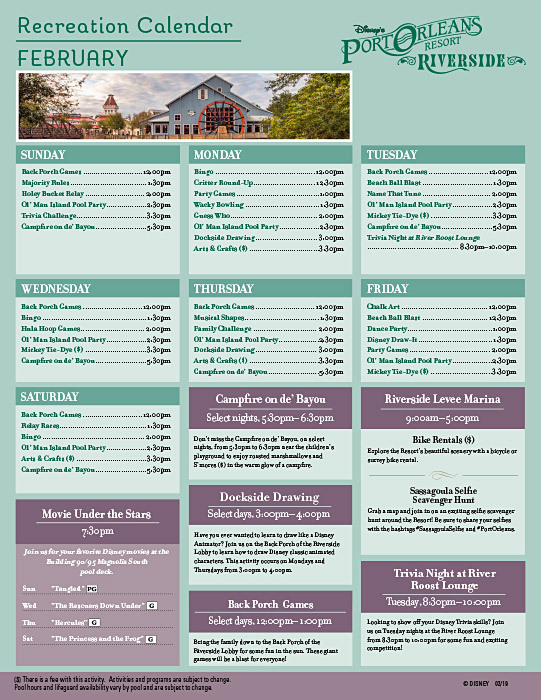 The January 2019 Recreation Activities and Movie Schedules for Port Orleans Riverside and Port Orleans French Quarter are now available. 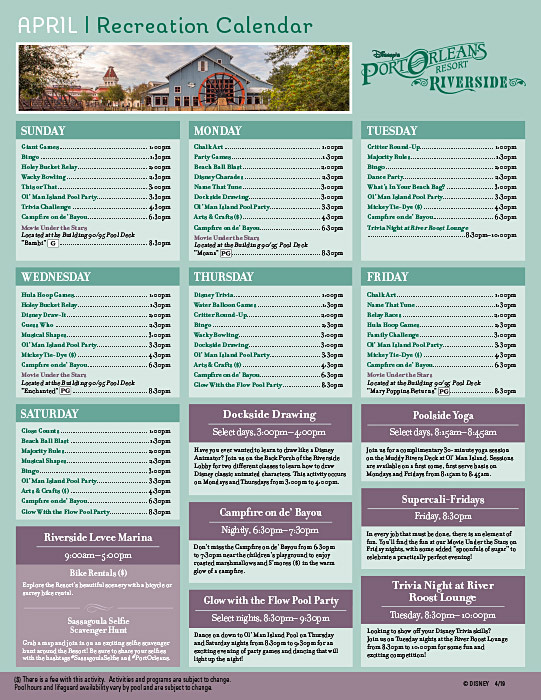 See the main Recreation Activities Schedules page for full-size printable PDF versions. The main feature swimming pool operating hours are currently 10am—8pm. These hours are enforced and the feature pools are gated and locked when there are no lifeguards on duty, however the five Riverside leisure (quiet) pools are generally available at any time, within reason. Movies Under the Stars will be screened at 7:30pm on Sundays, Wednesdays, Thursdays and Saturdays at Riverside, or Mondays, Tuesdays and Fridays at French Quarter. Note: the Riverside movie screenings are now being shown on the pool deck area near to building 95 (between Parterre Place and Oak Manor). Painting at the Roost ($) (Riverside, 5pm—7pm Mondays) — Drift on down to the River Roost Lounge for our instructor-led wood sign painting class. Relax while you paint your own piece of charming southern décor, accompanied by a beverage of your choice and light bites. Ages 12 and up. Space is limited. Stop by the Riverside Levee Marina or call 407-934-5405 to reserve a seat! No visit to Port Orleans Riverside would be complete without spending an evening in the company of the legendary “Ye Haa” Bob Jackson at the River Roost Lounge, playing 8:30pm—midnight four nights a week (Wednesday, Thursday, Friday and Saturday). Note: Bob will be on vacation from 7-12 January, returning to the Port on his regular nights from 16 January.